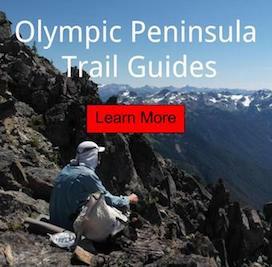 I get a lot of questions about the snowpack in the Olympic Mountains, from people that are planning to hiking in the Olympic National Park and Forest. In an era of social media, this can often be confusing to people. With a few taps of their finger, a hiker can see inspirational photos of the mountains. However, this can get you into trouble, because each year the snowpack is different. Example: In 2015 was a record low snowpack, in which most places were hikable in March. Moving forward to 2017, this is not the case! Some places in the interior still have over 6 feet. Mountaineering skills are required on northern slopes for most of the hiking season. Traveling on steep and icy snow can be fatal, if you do not have the proper experience. Do not just bring the hiking gear, but have the skills to use it. This may save your life! Always check trail conditions from a Ranger before heading into the backcountry. Most importantly, be safe and have fun!